Argus Match Matic C3 Camera Ad 1959 This is a May 11, 1959 advertisement It is a nice black and white ad from Argus Camera Inc of Ann Arbor, Michigan Ad shows the Argus Match-Matic C-3 and it reads, ""Makes perfect slides, as easy to set as a clock"" In excellent condition. Photo is taken through plastic and may show wrinkles or crookedness that is not in the ad. This magazine tear sheet measures 10 1/2"" wide by 14"" tall. 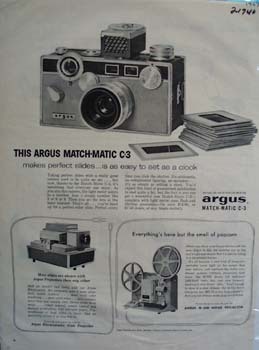 Items Similar To "Argus Match Matic C3 Camera Ad 1959"